Dr. Ben Carson, in a speech before employees of Housing and Urban Development, the department he now runs, likened slaves to "immigrants": "That's what America is about, a land of dreams and opportunity. There were other immigrants who came here in the bottom of slave ships, worked even longer, even harder, for less. But they, too, had a dream that one day their sons, daughters, grandsons, granddaughters, great-grandsons, great-granddaughters, might pursue prosperity and happiness in this land." Late-night comic Trevor Noah said: "It makes them sound like they work at Wal-Mart. ... Calling slaves 'immigrants' is like saying: 'It's not kidnapping. That person just got a free vacation in a basement.' ... Slaves weren't immigrants. Because an immigrant has choice. They choose the country they're going to because they hope it will bring them a better life. Saying that slaves are just another group of immigrants erases how black people were uniquely oppressed in America. It helps justify blaming African-Americans for their hardships." Actor Samuel L. Jackson tweeted: "OK!! Ben Carson ... I can't! Immigrants? In the bottom of SLAVE SHIPS??!! MUTHAF---- PLEASE!!! #d---headedtom." Actress Whoopi Goldberg said: "Were the slaves really thinking about the American dream? No, because they were thinking, 'What the hell just happened?!' You know, when people immigrate, they come with the idea that they're going someplace for a better life. ... It's voluntary. ... How does he miss what slavery is?! How does he miss that no slave came to this country willingly? ... Ben, 'Roots.' Watch 'Roots.'" TV personality Star Jones tweeted: "No way in the world he is that friggin ignorant." Using the pile-of-excrement emoji, she called the renowned neurosurgeon "(expletive) for brains." She ended the tweet: "#UncleTom thy name is #BenCarson." Rep. Keith Ellison, D-Minn., insists that Carson's "slave equals immigrant" perspective means he is unqualified to lead HUD because Carson "doesn't know how urgent it is to confront racism" in housing: "It's disturbing to me, and it should be to every American, not just black Americans. ... For him, the HUD secretary, to have a stunning misunderstanding of history like that, is really, really striking. 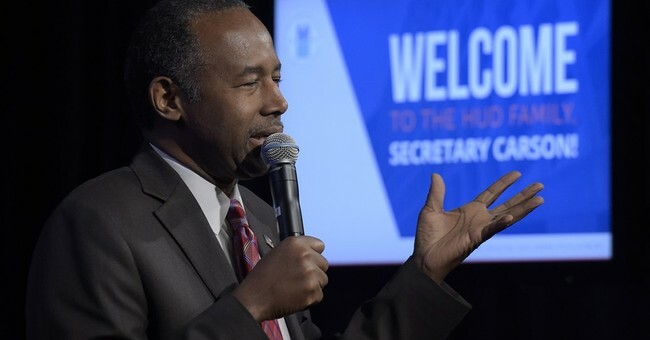 ... And so for the HUD secretary not to get that means that he doesn't know how urgent it is to confront racism and discrimination in housing, which is a very scary thing for the HUD secretary to not understand." Following the uproar, Carson posted this clarification on Facebook: "The slave narrative and immigrant narrative are two entirely different experiences. ... The two experiences should never be intertwined, nor forgotten, as we demand the necessary progress towards an America that's inclusive and provides access to equal opportunity for all." The "insensitive" and "demeaning" slave-equals-immigrant argument was made on a number of occasions by President Barack Obama: "It wasn't always easy for new immigrants," Obama said at a 2015 naturalization ceremony for new citizens. "Certainly it wasn't easy for those of African heritage who had not come here voluntarily, and yet in their own way were immigrants themselves. There was discrimination and hardship and poverty. But, like you, they no doubt found inspiration in all those who had come before them. And they were able to muster faith that, here in America, they might build a better life and give their children something more." Even "Daily Show" host Noah admitted, "President Obama said something similar in 2015." But, said Noah, "You could tell before (Obama) said that part he was thinking, 'Damn, my speechwriter f---ed up.'" In fact, according to the Federalist, Obama likened slaves to immigrants on 11 different occasions. "Whether our ancestors landed on Ellis Island," said Obama, "or came here on a slave ship or crossed the Rio Grande, we are all connected to one another. We rise and fall together." Goldberg, Noah, Jackson and Ellison were obviously occupied the 11 times Obama showed he "doesn't know how urgent it is to confront racism." Why the silence over Obama's many slave-equals-immigrant comments versus the desk pounding by the same critics when Carson says the same thing? Carson represents an existential threat to the left. He is deadly to their cause -- a black man, raised in poverty by a hardworking, welfare-abstaining single mom who taught her children to embrace hard work and education. The left believes that blacks are perpetual victims of slavery, Jim Crow and racism. It is vital for the existence of the Democratic Party to convince blacks to vote like victims in need of protection from the racist, sexist retrogrades known as Republicans. So black conservatives like Carson, who argues that welfare creates dependency, who demands choice in K-12 education and who believes hard work wins, must be attacked, marginalized and dismissed as "against their own people."